Neat-Oh! knows that every little girl is a princess, every day. 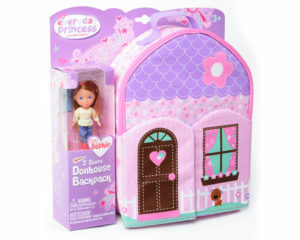 The Doll & Dollhouse Backpack are part of Neat-Oh!’s line of Everyday Princess products. They’re toys devised to encourage imaginative play – and to empower young girls to design and control their own creative realm. The included doll is 4.5” tall, is posable and has beautiful long thick hair perfect for brushing. She comes with a lightweight backpack with adjustable straps – perfect for transporting the doll, her Everyday Princess friends, and whatever else she wants to bring along. 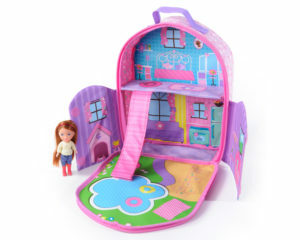 The pack unzips into a two-story, castle-themed dollhouse, complete with a slide and swimming pool. It’s take-anywhere, all-in-one play. When playtime is over, the castle zips back into an easily transportable backpack, with all the dolls and accessories stored safely inside. The Dollhouse Backpack is one of Neat-Oh!’s highly regarded ZipBin storage products. ZipBin goods offer smart, self-contained ways to store, play with and transport toys. Neat-Oh!’s play-and-store solutions have won numerous awards, and are universally recognized for their clever, patented designs and ease of use.